Sometimes the simplest recipes are the best. We have quite a few in North America, most often filed mentally under the term “mom’s kitchen.” You know, family food. Sometimes, though, you just crave something a little exotic. Now to those of Asian descent this won’t seem very unusual, but to those of us who subsist on boiled potatoes and the like mirin is quite an exciting introduction. This may be Japanese “family food.” I’m not sure. The signature characteristic of family food is that it is filling, and easy to prepare. That’s the case with this dish. 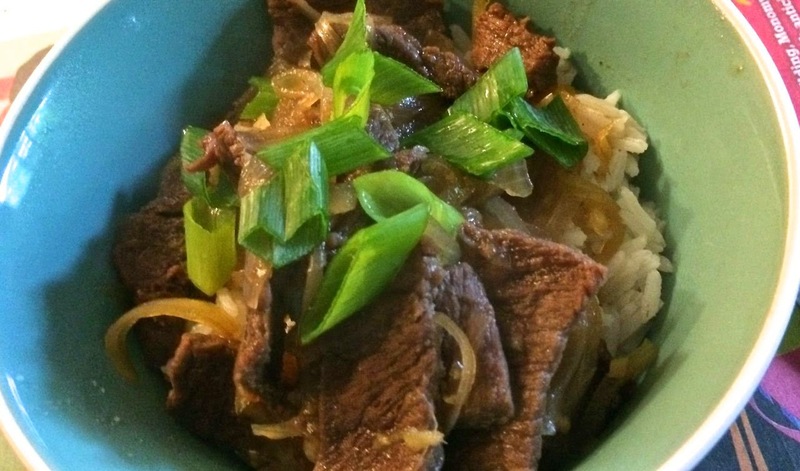 Super simple, super delicious, and super fast. I have a real reluctance to turn on the stove during the heat of summer. So anything I can do to reduce the amount of heat it throws into my home is appreciated. We still have to eat, and we should still eat well. But at this date (nearly the end of July) we’re probably getting a little tired of abandoning the kitchen for the barbecue. Or at least we are looking for a little diversity between chops, burgers and hot dogs. If you time everything right you can have this dinner on the table in the length of time it takes to cook rice. To slice the beef more easily, partially pre-freeze until fairly firm. Then slice with a sharp knife. Set aside. *** To ensure tender beef slice against the grain. 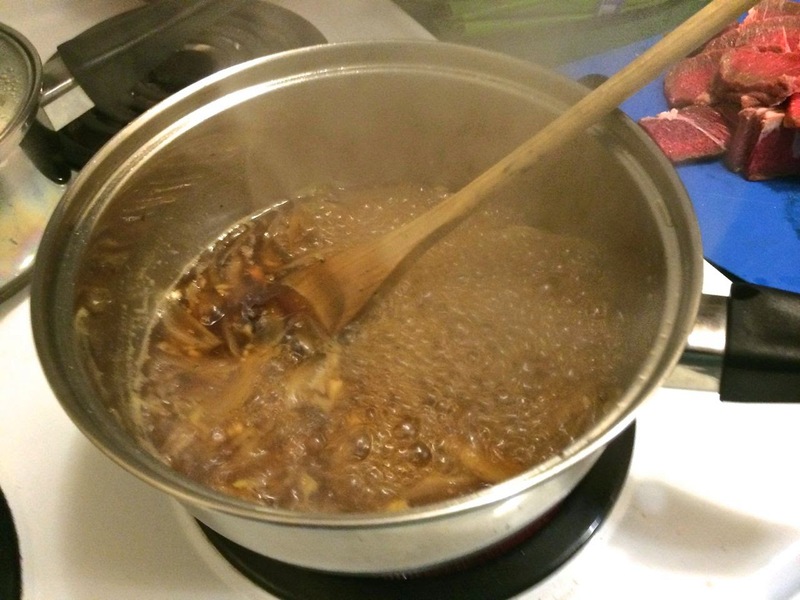 Bring broth, soy sauce, mirin, onion, sugar, ginger and garlic (and chilli if using) to a boil in a saucepan. Reduce heat to medium let cook until the volume is reduced to almost half. It should start to look a little syrupy. Mix the cornstarch with a teaspoon of water and stir into the broth. Then add the onions and cook until they are tender, about 4-5 minutes. Add the beef slices and cook until just barely done, about 1-2 minutes. 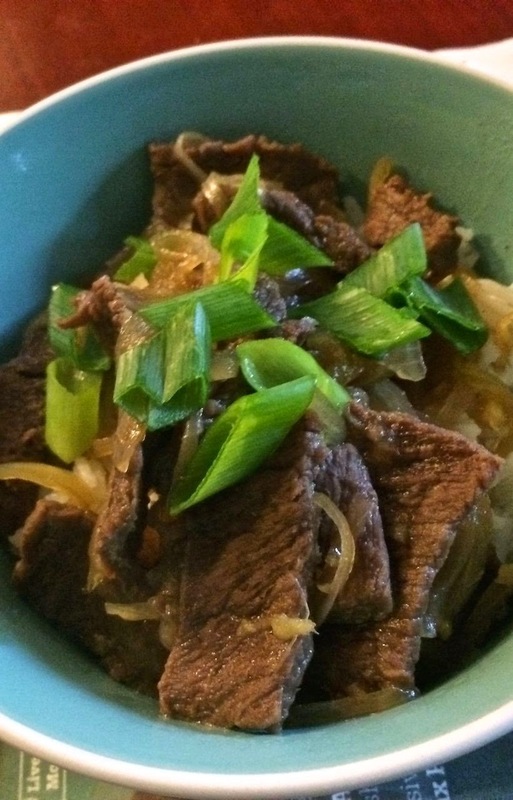 Serve over white rice with the green onion sprinkled on top. If beef isn’t your thing, you can substitute thin slices of chicken breast.